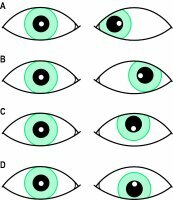 failure of the visual axes to remain parallel when fusion is possible; see also strabismus. The constant or intermittent deviation of the visual axis of one eye from the point of fixation, which is seen with both eyes open. No obstante, Heterotropias es un libro de incalculable valor no solo para profesores sino tambien para estudiantes especializados en literatura y cultura latinoamericanas. Although the scan is nearly always normal, the authors always advise, and themselves perform, an MRI on all patients with a sudden onset heterotropia (Figure 1). It is more significant if the diplopia is of sudden onset, as the most likely cause is heterotropia due to nerve palsy. A cover test should be carried out at both distance and near, to establish the type and size of the heterotropia. When pre-school children present to the optometrist with heterotropia, it is likely to be of recent onset. Further investigation (eg, electrophysiology or neuro-imaging) are not generally felt to be appropriate unless these initial steps reveal an abnormality (eg, suspicious discs) or the heterotropia is atypical (eg, increasing in angle, incomitant, associated with nystagmus, amblyopia not responding to treatment). It is therefore not surprising that optometrists play a key role in the detection of heterotropia in this age-group. Before the cycloplegic is instilled, the effect on the heterotropia of correcting the refractive error revealed by 'dry' refraction should be investigated. If an adult develops heterotropia then they are likely to have diplopia and confusion.